History: 30 year old man with wrist swelling and pain. 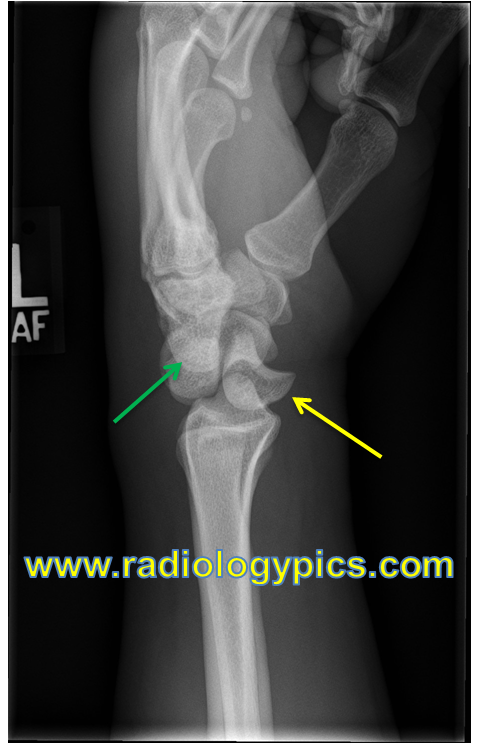 Perilunate Dislocation – Frontal radiograph of the wrist shows a pie shaped lunate (yellow arrow), with widening of the lunotriquetral interval indicating disruption of the lunotriquetral ligament (green arrow). 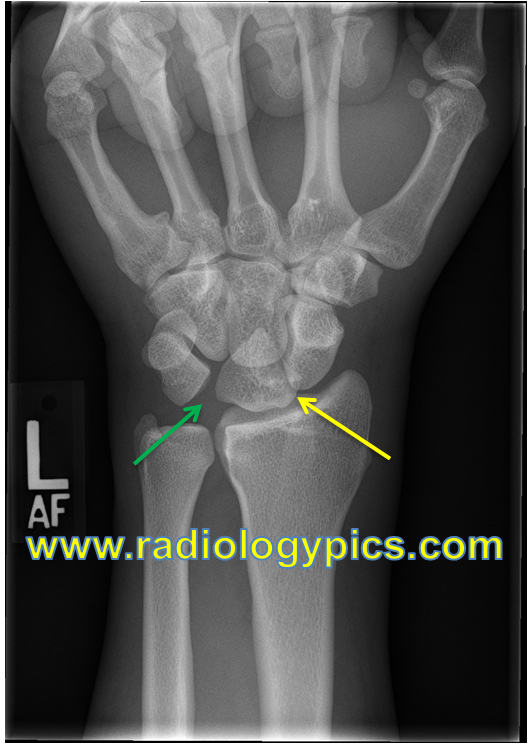 Perilunate dislocation – Lateral radiograph of the wrist reveals proximal and dorsal displacement of the capitate (green arrow) with volar displacement of the lunate (yellow arrow); however, the lunate remains articulated with the radius, indicating this is a perilunate dislocation. This is a case of a perilunate dislocation. A perilunate dislocation is a carpal instability pattern that usually results from hyperdorsiflexion of the wrist. In the perilunate dislocation pattern the capitate dislocates dorsally and moves proximally and rotates the lunate in a volar direction while the radiolunate articulation is maintained. This must be distinguished from a lunate dislocation, in which the capitate drops completely into the space occupied by the lunate and the lunate is dislocated from the radius. This classically produces what has been referred to as the “spilled tea cup” appearance of the lunate on the lateral radiograph of the wrist.